Duluth’s Chester Congdon is best known as the man who built Glensheen, the elegant Jacobean manor house and estate perched along the shore of Lake Superior at 3300 London Road. Congdon, an attorney by trade, made his fortune after becoming chief counsel for the Oliver Mining Company in 1892. When the company was bought out by J. P. Morgan in his effort to create U. S. Steel, Congdon became one of the wealthiest men in Minnesota. The lifelong Republican was an admirer of Teddy Roosevelt—particularly Roosevelt’s efforts to expand the national park system. Using his newfound wealth, Congdon created a Duluth city park and laid the groundwork for an international highway along Lake Superior’s North Shore. In 1905 Chester Congdon began construction of his magnificent Duluth home. Congdon’s estate included twenty-two acres of wooded land along Tischer Creek, extending from the shore of Lake Superior up to Greysolon Road. Much of the land had been settled in the 1850s by Swiss immigrants Urs and Elizabeth Tischer, whose name became attached to the stream. The Tischers owned land from the mouth of the creek up the hill through most of what is now Congdon Park. They farmed some of the land, and at the waterfront, Tischer’s landing was considered one of the best on the lake. 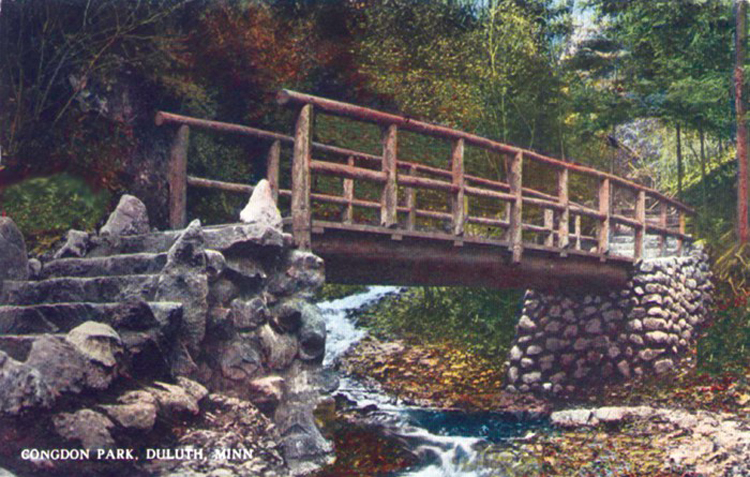 As part of the grand plan for his estate, Congdon approached the Duluth Board of Park Commissioners with the idea of creating a public park along Tischer Creek from the border of Glensheen upstream to Vermilion Road. Congdon’s East Duluth Land Company already owned much of this land. Congdon offered to donate land and cover the cost of purchasing additional property for the park. The park board’s help was needed to acquire the remaining land through condemnation. Congdon’s offer was based on more than simple aesthetics. Tischer Creek served as a sewer for houses in the Woodland area, and its water was badly contaminated. The Duluth News Tribune referred to the stream as “the open sewer known as Tischer’s Creek.” Congdon wanted to use water from the creek for the extensive gardens he planned to establish at Glensheen, and his offer to create a park was contingent on the city taking action to redirect sewage into a holding tank. Resolved, that this Board, for, and on behalf of the city, hereby extends a hearty vote of thanks to Mr. C. A. Congdon for the very generous donation of the Tischer’s Creek park grounds; a very desirable acquisition to the city’s holding in that particular, and be it further resolved that the said grounds be, and the same hereby are, named and designated ‘Congdon Park’. Congdon’s generosity continued when in May 1909 he offered the services of landscape architect Charles W. Leavitt of New York to prepare a plan for Congdon Park. Leavitt, who had designed the landscaping at Glensheen, proposed improvements to the park that included a roadway at the top of the slope on both sides of the creek valley, footpaths close to the creek, and a bridle path in between. The initial plan showed the most elaborate improvements in the area between Greysolon Road and Superior Street, where Leavitt proposed a botanical garden and a “Swiss chalet which could be used for shelter, for basket lunches, and a place for mothers and nurses to sit while they watch the children play.” As with Glensheen, Leavitt’s plans would be carried out by his associate, Anthony U. Morell. Unfortunately, Park Superintendent Henry Helm had already begun work on a road through the park, located close to the creek. A brief firestorm broke out as a number of unhappy citizens appeared before the park board in June to complain that Helm’s road was destroying the park’s natural beauty and to urge the board to follow Leavitt’s design. Board members assured the concerned citizens that they intended to follow the landscape architect’s plans, and the storm subsided. Realistically, the board did not have money to carry out all the improvements anyway and had to rely on Congdon to pay for the work of the landscape architects. One reason for the citizens’ concern may have been that in early 1909 a syndicate of local men—including F. A. Patrick (a member of the park board), Alexander Hartman, Albert M. Marshall, and C. E. Van Bergen—had purchased a sixty-six-acre tract of land extending from Superior Street to St. Marie Street on both sides of Tischer Creek at a cost of $66,000. The developers planned to make this the “finest residence section in the city.” They intended to put the property on the market “only in large blocks such as are in demand for fine residences with spacious grounds.” By then landscape architects Anthony Morell and Arthur R. Nichols had created a partnership and set up a practice in Minneapolis. The investment group hired Morell & Nichols to lay out fifty-four new building sites surrounding Congdon Park, each large enough to permit for ample drives and the preservation of groves in their natural state. The plan also required that all deeds contain the proviso that only “magnificent homes” would be constructed. Absolutely no flats, double houses, or apartments of any kind were permitted in the new district. According to the News Tribune, Congdon Park had already been “transformed through the efforts of the park board into the most picturesque sylvan district within the city limits,” and the new homes would take advantage of this lovely park setting. Despite the elaborate landscape plan prepared for Congdon Park, the board made few changes. By 1911 they had completed on the west side of the park a twenty-foot roadway, an eight-foot bridle path, and a footpath at the edge of the stream that included stairs, rustic bridges, and stepping stones. No additional developments were made. Over the years, sections of the footpath disappeared as the creek washed away the loose soil, but the bridle path and roadway remained intact. 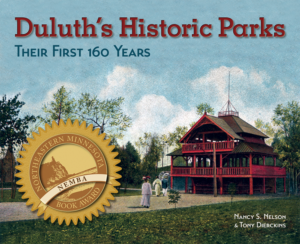 The park fell into disrepair after Duluth’s change in government in 1956. In 1972 the Junior League of Duluth, working with the Department of Parks and Recreation, restored the nature trail with the help of local Boy Scouts and students from the University of Minnesota Duluth. The flood of June 2012 damaged parts of the footpath and nearly wiped out the roadway between Fourth Street and Vermilion Road. Despite the damage, thanks to the natural beauty of Tischer Creek, Congdon Park remains one of the loveliest stream parks in Duluth’s park system.